The #1 New York Times bestseller and National Book Award finalist that "breaks new ground for graphic novels" (Francois Mouly, art editor, The New Yorker). 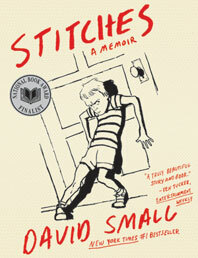 David Small, a best-selling and highly regarded children's book illustrator, comes forward with this unflinching graphic memoir. 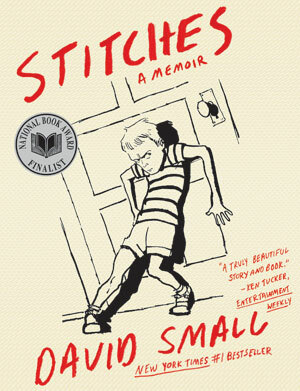 Remarkable and intensely dramatic, Stitches tells the story of a fourteen-year-old boy who awakes one day from a supposedly harmless operation to discover that he has been transformed into a virtual mute—a vocal cord removed, his throat slashed and stitched together like a bloody boot. From horror to hope, Small proceeds to graphically portray an almost unbelievable descent into adolescent hell and the difficult road to physical, emotional, and artistic recovery. A National Book Award finalist; winner of the ALA's Alex Award; a #1 New York Times graphic bestseller; Publishers Weekly and Washington Post Top Ten Books of the Year, Los Angeles Times Favorite Book, ALA Great Graphic Novels, Booklist Editors Choice Award, Huffington Post Great Books of 2009, Kirkus Reviews Best of 2009, Village Voice Best Graphic Novel, finalist for two 2010 Will Eisner Comic Industry Awards (Best Writer/Artist: Nonfiction; Best Reality-Based Work).